Napoli postponed Juventus’s march to the Serie A title and consigned Chievo to relegation with a 3-1 win at the Stadio Bentegodi on Sunday. Carlo Ancelotti’s side needed a victory to ensure that the Turin club, who lost 2-1 at SPAL on Saturday, would not wrap up their eighth consecutive league championship with a record six games to spare. Two goals from Kalidou Koulibaly either side of an Arkadiusz Milik strike confirmed Chievo’s demotion despite Bostjan Cesar’s late consolation, after a miserable season in which the Verona club have recorded just one win in 32 games. The result leaves second-placed Napoli on 67 points, 17 behind runaway leaders Juventus on 84. Goalkeeper David Ospina returned for the first time since being hospitalised after suffering a head injury in a league game with Udinese on 17 March. Milik, Lorenzo Insigne and Dries Mertens all started in an attack-minded line-up and Ancelotti suggested he could take the same approach for the visit of Arsenal this week. Chievo consolation: Napoli profited from some slack finishing when Koulibaly snuck in at the front post to head in the opener from close range after 15 minutes. 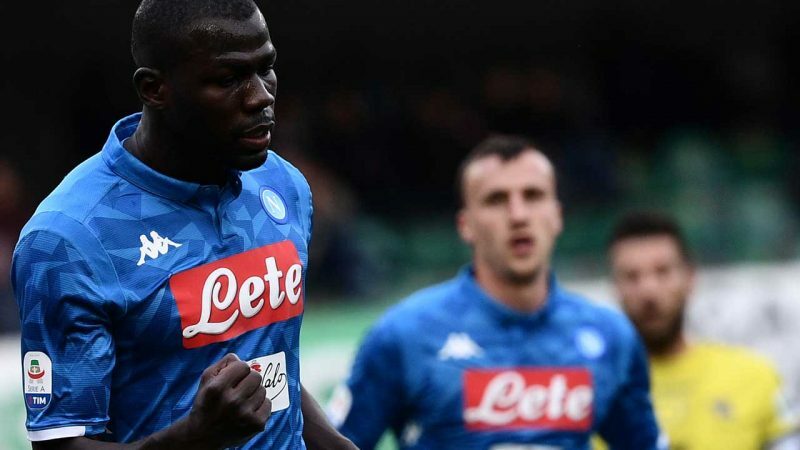 Milik doubled Napoli’s lead with a curling strike into the bottom corner from outside the box midway through the second half before Koulibaly completed his brace with a low finish inside the final 10 minutes. Bostjan Cesar headed in from a corner to pull one back for Chievo with the final act of the game. Domenico Di Carlo’s side have won one game, drawn 11 and lost 20 so far this season but prop up the table with just 11 points, having been handed a three-point deduction for false accounting at the start of the campaign.